When the sun comes out – which it is finally, reliably doing around these parts – our world changes. People’s faces break out in smiles (even in Basel ;-)), arms and legs are bared and bronzed, tables and chairs spring up on pavements outside cafés and restaurants, happy swimmers bob along on the Rhine’s speeding current and there’s a contented summer buzz in gardens and vineyards. 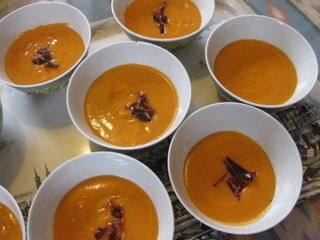 Cue for iced soups. Refreshing and thirst-quenching, they’re a cinch to make: all you need is a blender or food processor, a few basic ingredients (tomatoes, cucumber, peppers, avocados can play either starring roles or bit parts) and about 6 minutes’ of your precious summer time. And of course by definition (mine anyway) they’re uncooked, so no sweating over the proverbial hot stove – think salad in liquid form. 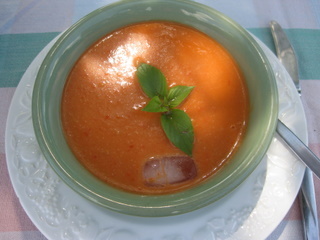 A classic iced soup – a cousin of gazpacho but thicker, smoother and sinfully creamy (but no cream) – which is gulped down gratefully in the dog days of summer in Córdoba/Andalucia, Spain’s oven, where temperatures hover around the 40-degree mark for most of July and August. It has just tomatoes, yesterday’s bread, garlic, sherry (of course) vinegar and olive oil. I take a tip from my son Ol and add a little raw apple, which brings out the sweet notes in the tomatoes. Serve it well chilled, topped with strips of jamón and hard-boiled egg (hen’s or quail’s). A nice twist on an old favourite, served in chunky glasses and topped with chopped peppers, egg, cucumber and onion so you can see the different layers. 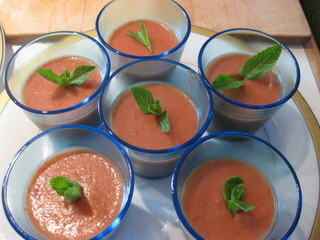 This great gazpacho variant (recipe from chef Anton Canelles at Restaurant Senzone in the Hotel Palau de la Mar in Valencia) is made with half-and-half tomatoes and strawberries – they bring a little sweetness (welcome in our northerly climes, where tomatoes are not always as ripe as they might be) without being overwhelmingly fruity. 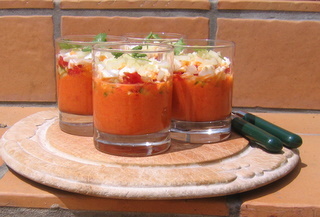 Serve in glasses. A delicate, pale green affair with a bit of an Asian feel – chill the soup well, take it to a picnic or potluck in a thermos and bring glasses for serving. 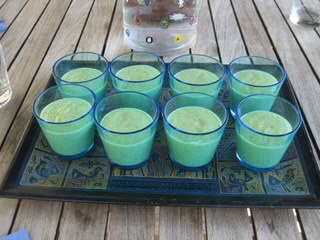 I have been thinking about trying to make cold soups lately and these are the perfect inspiration. Thanks Sue ! just the weather for them, right? Great to hear from you Maria, enjoy the summer! These look absolutely delicious. The great thing is that all the ingredients are available in Mexico. Did I ask you to please add Brinley to your blog? She would enjoy receiving your wonderful communications.